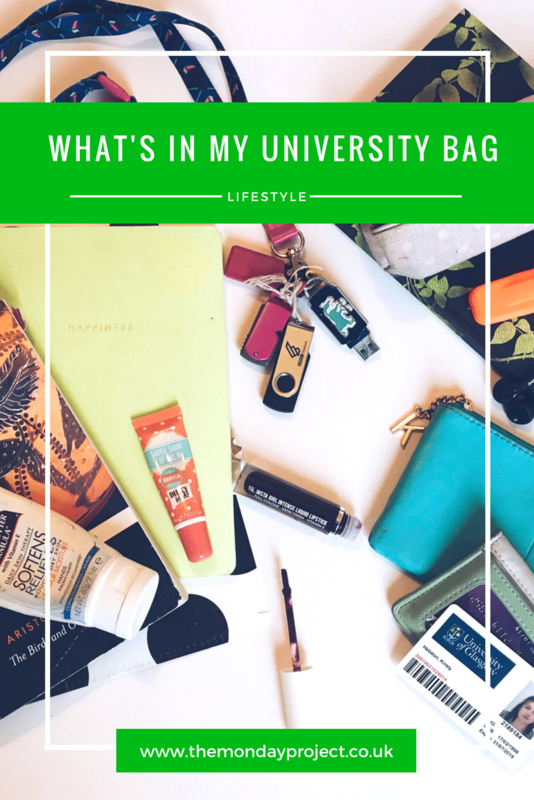 This is my second blog titled What’s In My Bag | Uni Edition so I think we can give me a round of applause for creativity. Truth to be told, I wasn’t sure what else to call it. Maybe Uni 2? But that sounded even more lame. 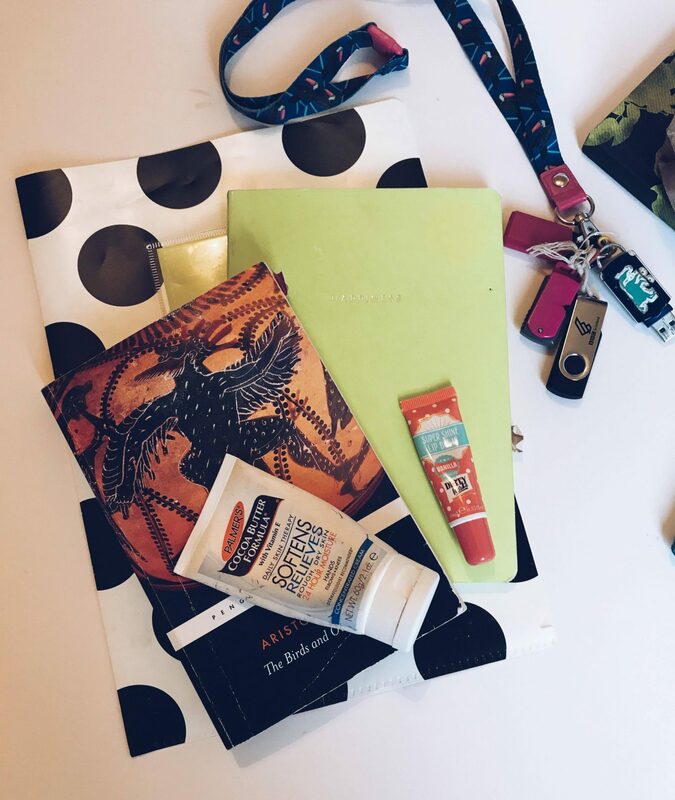 Anyway, it’s a look inside a student’s bag. I’ve added a few new bits since last time I posted this. It’s a new academic year, I’m now in my third year of a four year degree, I have less class time but more work so obviously I had to switch things up. I think coming to university, the most important think you need, without a single shred of doubt, is a back pack. 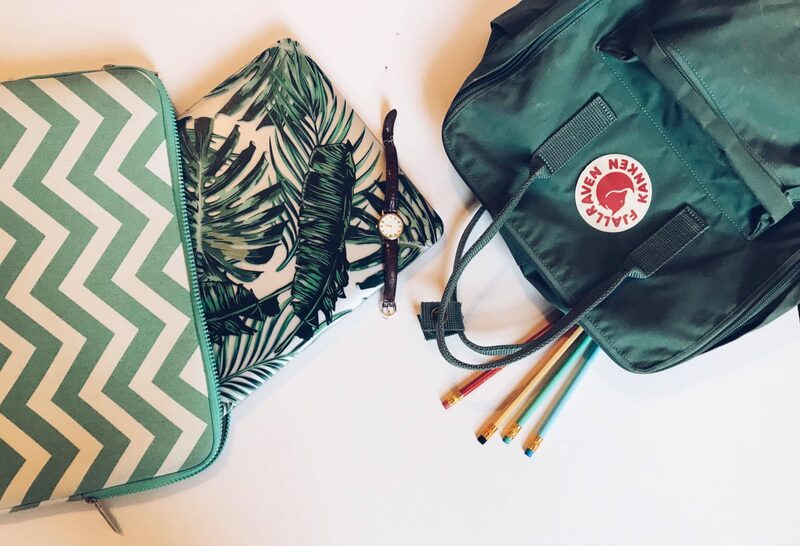 You will be lugging around a lot at times and in Glasgow, it rains, so a tote bag is going to do you no good when carrying books and your laptops. You don’t want them to be soggy. I couldn’t live without mine, it is so spacious and it is a muted tone, it goes with most items in my wardrobe. It does wonders for your back and shoulders when it is full as it spreads the weight and doesn’t leave you feeling sore. So yeah, I 10/10 recommend a Fjallraven Kanken rucksack, they are the absolute bomb. I’ve had mine since about May this year and it is a game changer. I love the boxy shape as it means I can fit in so much more and plenty of room for a laptop, a water bottle and all my books. I have it in the colour Forest Green which means it goes with everything without being boring. I also always carry my laptop with me to university as I only have one or two classes a day but usually spend an additional 3 or 4 hours in the library (haha, just rereading this back before posting tomorrow and this last snippet of information made me laugh, I was so good at the beginning of the semester). Using my own laptop is something I prefer as I already have everything I need on it, it is so much faster to work with and there is always the guarantee I’ll be able to get some work done as I’m more likely to find a seat. I prefer to study on the silent floors and as I usually get in to uni at around 9, I usually have my pick of a seat looking out over the main building from the 8th floor unless it is exam season. I’ve had my Macbook Pro for almost a year now and I swear I love it more and more every day. The palm print case is from Amazon and I love how pretty it is whilst preventing my laptop from getting scratched. Having a case is really great as it allows you to switch it up and be creative. I also have a protective sleeve from Amazon just to give it a little more protection when it is rattling around in my bag. Books wise, I usually have one book containing plays of Aristophanes for my Classics module as I have to refer back to the play when doing work for seminars. I also have a yellow Paperchase notebook for Classics notes, the colour is a little too bright but I picked this up with a voucher in a panic at the Paperchase within the Next Home store outside Edinburgh so there wasn’t much choice. I also have a polka dot sleeve filled with my notes from my Reformation History module and a hard back Next notebook which I use for my German Re-Unification History module. I’ll also usually have a couple of library books that I have out on loan too. My pencil case is super old and I’m pretty sure it was a birthday present for my 17th birthday but it is a super good size and I love the pink polka dot. I also usually carry headphones so I can listen to some music whilst in the library. My purse is from Primark and my cardholder was a gift from my sister but I think it is from Oliver Bonas. I also carry my four (yes excessive) USBS on a lanyard from Paperchase, which was another gift from my sister. More notebooks lol but my diary is from Ohh Deer (the November Papergang box) and for once, it is actually quite full! I need to refer to it quite often now which is a bit of a change from the usual mundane set up I call a life. I wouldn’t have chosen this print myself but it has really grown on me this last year and I’ll be sad to say goodbye at the end of 2017. 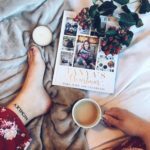 I also carry a Katie Loxton notebook which has “Ooh La La” on it which I use for all my blogging and life admin, but mainly blogging. 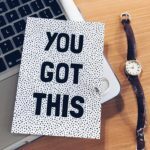 I use it to write post schedules, collabs, blogging ideas etc. And the occasional to do list. But mainly for to do lists I bring an Ohh Deer list notepad, which is from the April box. Other little things include my phone (obviously) which has a gorgeous palm print cover from Urban Outfitters but I used my phone to shoot these pictures it obviously isn’t in them. I also have a Dirty Works lip balm, some Palmer’s Cocoa Butter hand cream and my current lipstick of choice is Primark liquid lipstick (how classy) which cost only £2 and is a dark purple shade. 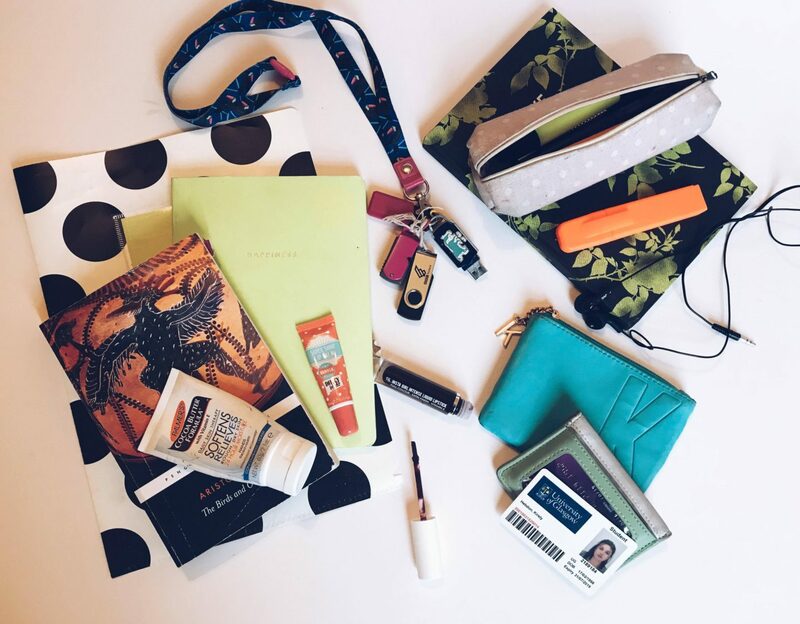 So there is a little what’s in my bag uni edition update – I’m super nosy and love seeing what people have in theirs (or in their bathroom cupboard or their christmas stocking or anything really – I’m just bloody nosy). And I left these photos right up until the last moment to take when the light was failing so I can only apologise.